With today’s advances in water tech, irrigators see the benefits in efficiency and affordability. U.S. water rates are rising, water restrictions are becoming the norm, and technology is more affordable than ever before. Together, these facts are driving trends in irrigation controllers, setting the stage for more efficient, affordable and compliant watering on residential and commercial landscapes across the country. “The cost of technology is dropping rapidly, so this whole confluence of events puts us in a position where it’s going to affect irrigation and the irrigation controller more than any other category in the water management business,” says Mike Mason, president and CEO of Weathermatic, a Garland, Texas-based manufacturer of smart irrigation products. 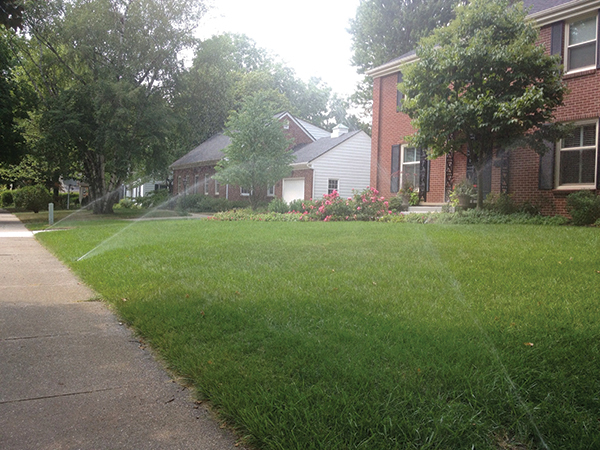 So much in irrigation control has changed in the last several years—perhaps attitudes toward water use most of all. During the construction boom of 1997 to 2007, builders tended to install cheap or common irrigation systems, without considering water restrictions, water cost or any other water-related concern, Mason says. The result for commercial businesses is new and improved central control systems, Mason observes. Where these controllers once cost about $10,000 to $15,000 each, people now can buy them for less than $1,000 each, he says. Cloud computing makes it easier for large companies with several office locations to comply with local water restrictions, too, say Mason and Chris Spain, founder of HydroPoint Data Systems, a maker of smart water management products headquartered in Petaluma, Calif.
Spain says irrigation managers also can expect to see an increase in the use of on-site flow sensors soon if they haven’t already, particularly in regions subject to water restrictions. Until now, commercial landscapes haven’t used flow sensors much because they’ve been too expensive to install, he says. Among them are high-resolution flow meters that work well even on low-flow sites; and flow sensor/master valve combinations that make for easier installation. Such solutions will empower commercial irrigation professionals on the job now and in the years to come, giving them real-time tools for identifying excessive water use and waste, Spain says. High-resolution flow meters can be especially useful, he says, allowing irrigation professionals to spot small leaks or potential leaks that before would have been missed. Flow sensing systems are capable of texting or emailing commercial irrigators on-site to alert them to overwatering or a mainline break. Greg Winchel, owner of Grand Rapids, Mich.-based Winchel Irrigation, where 60 percent of the clientele is residential and 40 percent is commercial, says the company has been using smart controllers almost exclusively for four years. But smart controllers are hardly new. So if there’s a trend Winchel has observed in irrigation controllers from a user standpoint, it’s that manufacturers continue to improve them. application rate. “With all those factors in there, and an on-site weather pod collecting temperature and rainfall amounts, it’s more informed and can do a better job of irrigating,” Winchel says. John Wascher, product manager, residential controllers, for Hunter Industries in San Marcos, Calif., says the percentage of equipment in the field with “smart” capabilities is still quite small. Nonetheless, he’s seeing municipalities install smart water meters on residential properties to better enforce water restrictions. Examples of these products include controllers from Skydrop, Rachio and other startups. And while many homeowners are familiar with such applications for things around the home, such as thermostats and locks, they’re often surprised to learn there are also “easy-to-use, residential smart controllers that also offer self-adjusting and cloud-based programmability features,” says Eric Santos, vice president of irrigation services for Brickman/ValleyCrest Cos., based in Calabasas, Calif.
“What makes these smart controllers different is that they communicate to the cloud through the home’s Wi-Fi signal, as opposed to using a built-in cell modem,” he says. They also don’t require an annual subscription fee, he says. “As the general public becomes more and more aware of the features and ease of use of home automation products—including irrigation timers—devices that can operate off of a home’s Wi-Fi signal without reoccurring service fees will continue to gain market share,” Santos says. Wi-Fi controllers average $225 now, but as competition drives down costs or water districts offer rebates, homeowners could eventually pay less than $100 for them, Santos says. “The possibility of large manufacturers developing Wi-Fi-based smart controllers also could drive a decrease in the price point of these residential products,” he says. In the next few years, consumers can expect to see more advancements with wireless and/or battery technology, Wascher adds. Geraci is a freelance writer based in Cleveland. Geraci is a freelance writer based in Cleveland. She has worked as a professional journalist for more than 15 years, including six years as a writer for the Chicago Tribune. A graduate of Allegheny College and Northwestern University’s Medill School of Journalism, Geraci began her career as an editor at a newswire service in Washington, D.C., where she edited and distributed press releases from the White House and congressional leaders. She went on to become the community news reporter at the Jackson Hole Guide newspaper, winning two national feature writing awards. Her other experience includes working as a book editor in Chicago and as a professor of business communications at Cleveland State University.